The Aurora program also houses resources for people in the field of road weather information systems (RWIS), including documents, databases, and other weather-related websites and resources. A database of RWIS specifications and users survey results is available online. The MDSS Functional Specifications Template and Procurement Guidance document is available online. A road weather research report, Transportation Weather Research and Development Needs to Support ITS, prepared for Intelligent Transportation Society of America (ITS America) as part of a project sponsored by the Weather Information and Applications Special Interest Group is available online. 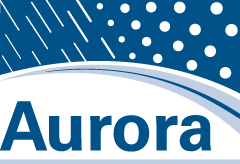 The Knowledge Base website is sponsored by Aurora to perform joint research activities in the area of road weather information, and Clear Roads, an ongoing pooled-fund research program aimed at rigorous testing of winter maintenance materials, equipment, and methods for use in highway maintenance. This website allows for sharing and retrieval of a variety of information related to the road weather and winter operations fields. The American Meteorological Society website provides access to AMS journals, newsletters, articles, and upcoming events in the world of weather. The Clear Roads website has an active link to Aurora and the research efforts of these two groups capture much of the research needed in winter maintenance. The Effective Anti-icing Program is a Manual of Practice for highway winter maintenance personnel, developed by Federal Highway Administration (FHWA). The ENTERPRISE Program is a pooled-fund study to develop, evaluate and deploy Intelligent Transportation Systems (ITS). An Evaluation of the Operation and Demonstration Test of Short-Range Weather Forecasting Decision Support Within an Advanced Rural Traveler Information System is an Advanced Traveler Weather Information System (ATWIS) evaluation report. The FHWA Road Weather Management and Operations Community of Practice is part of the FHWA knowledge exchange. The goal of the program is to encourage discussions related to weather-surface transportation issues and opportunities, to foster and contribute significantly to the research, development and implementation of related technologies and innovative practices. The Introduction to RWIS Standards is an FHWA publication. ITS International is a companion website to the industry’s leading independent publication for intelligent transport systems. The MDSS Pooled Fund Study is the result of a multi-state effort to bring about an operational Maintenance Decision Support System (MDSS), developed by an initiative of the FHWA, for state transportation agencies. The National Oceanic and Atmospheric Administration (NOAA) website provides US-wide conditions, forecasts, and warnings, with satellite imagery. The NTCIP (National Transportation Communications for ITS Protocol) is a communication interface that allows cross-platform compatibility for optimized information exchange. The “Road Weather Information Systems: Enabling Proactive Maintenance Practices in Washington State” is a report published by the Washington State Transportation Center that outlines the progress WSDOT has made and the problems they face with state-of-the-art RWIS/Public information systems. The RWIS Environmental Sensor Station Siting Guidelines is a document that provides guidelines for siting an RWIS Environmental Sensor Station (ESS) and its associated environmental sensors. The Salt Institute is a nonprofit trade association focused on the benefits of salt and is one of the most frequently used sources of information for winter operations among cities and counties. The Snow and Ice Pooled Fund Cooperative Program (SICOP) is a project of the American Association of State Highway & Transportation Officials that studies and implement best winter maintenance technologies. The website lists SICOP events, projects, and houses the Snow and Ice List-Serv. FHWA hosts the Winter Maintenance Virtual Clearinghouse for sharing the latest in winter maintenance research and technology. The World Meteorological Organization is the official website of WMO, a specialized agency of the United Nations that is the UN system’s authoritative voice on the state and behavior of the Earth’s atmosphere, its interaction with the land and oceans, the weather and climate it produces and the resulting distribution of water resources. It is headquartered in Geneva, Switzerland. The World Road Association (or PIARC) is an international information forum for road design, construction, and maintenance.